I made the slight mistake of photoing two processes at one time, but people are anxious to begin beading their Single Outline Diamonds, so I’m using these photos for now. Live and learn–next time I’ll try not combine too much information in one project. Please don’t be confused by the different colors in the different layers. 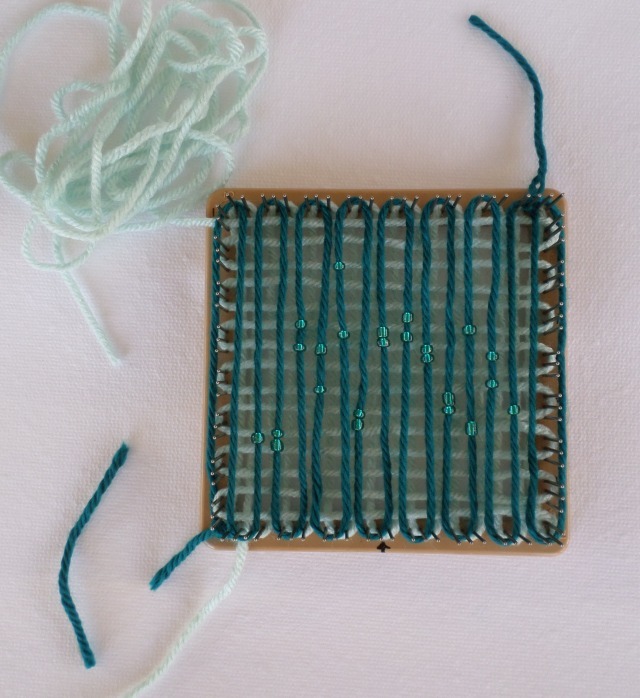 Just use all one color unless you feel ready to try combining colors and beads. REMEMBER you can click on a photo to enlarge it; click on the back arrow to return to these instructions. Thread all the beads on the yarn. Threading beads is rough on the yarn, so when you’re done stringing the beads, cut off the ragged yarn end, about 2-3 inches, and push the beads way down the yarn toward the skein. 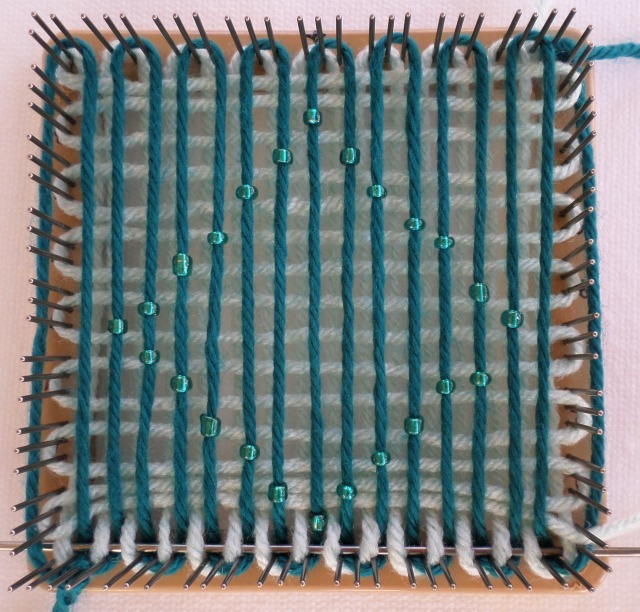 The beads will all appear on the third warp layer (L3). 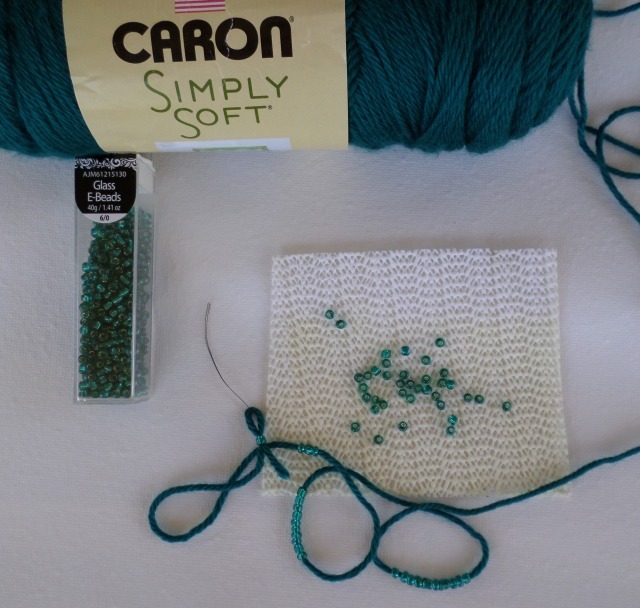 It’s not necessary to spread the beads out in a perfect diamond in correspondence with the rows each bead will end up in, but I recommend spreading them out roughly in this shape. 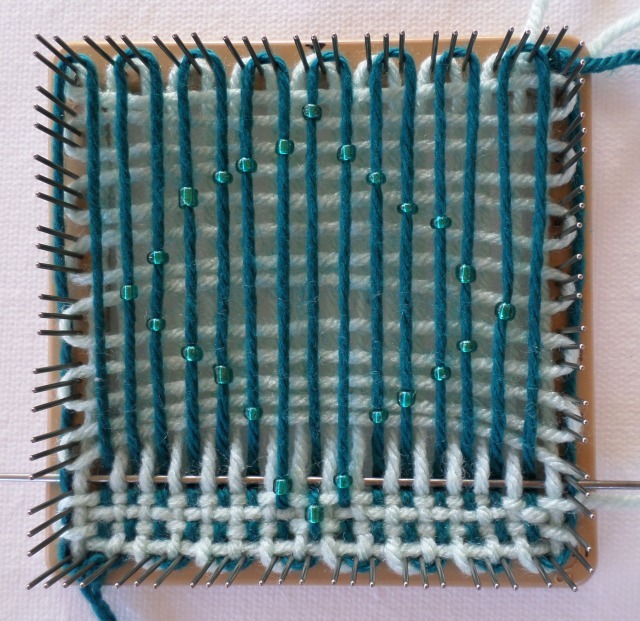 The beads will move some while you weave. 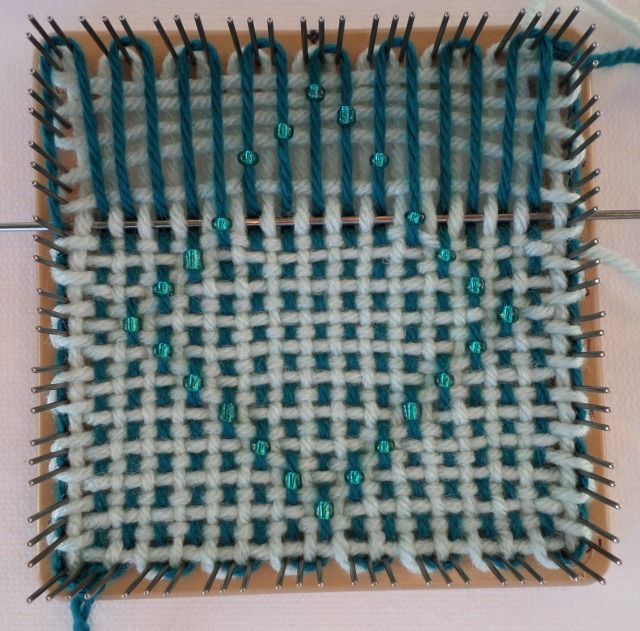 See photos below the pattern for further clarification while weaving. 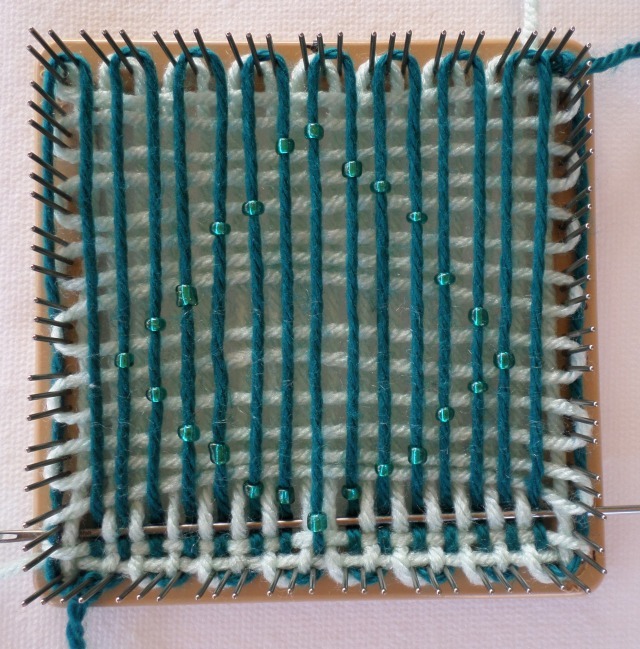 Spread the beads in a diamond shape and begin weaving. 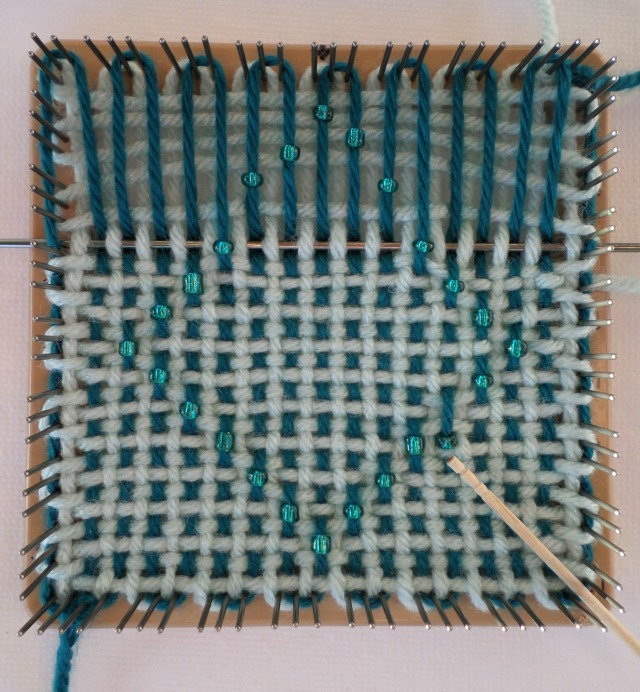 Row 1 is plain weave, no bead. *Every time you go U-3, you’ll also go U one bead. 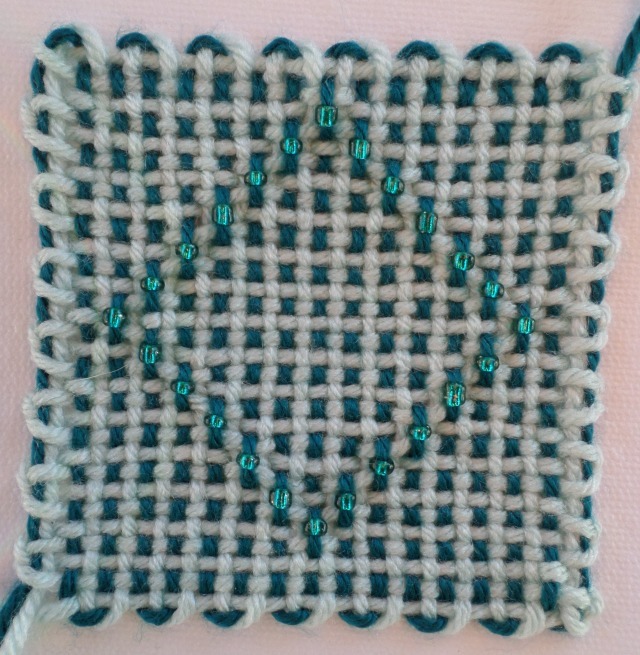 Row 3: take the beads from strands #7 and 9 U-3 according to pattern directions. Note that the L2 rows frame the R2 bead–one below and one above. This photo shows what might look like a mistake. As long as you’ve gone U-3 and taken a bead with you, there shouldn’t be a problem. Just slide the bead upward a little so it rests in the proper row. Toothpick points to bead correctly woven, but out of alignment. Bead has been tucked into its correct position. 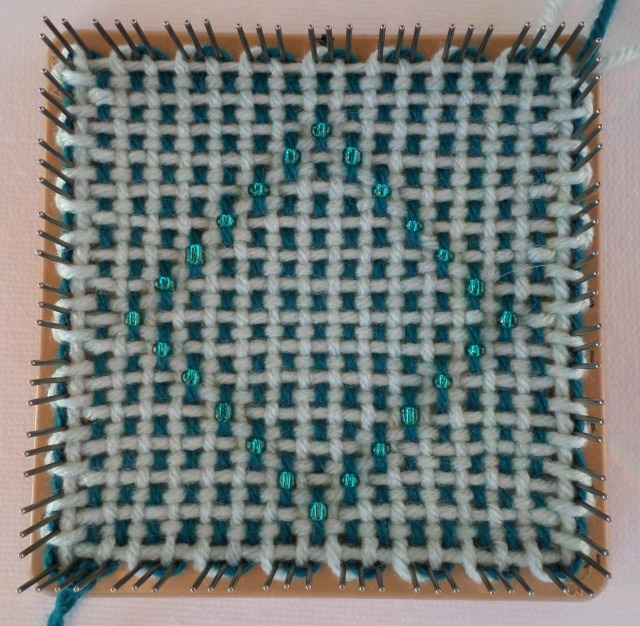 Finished square on the loom.